Thanks to AUSmotive reader Ed who has sent in these two images of the Volkswagen Golf R. The pictures were snapped at Fremantle wharf this morning. The great news here is that, firstly, the Golf R is closer to its local launch, but, also that the car in the picture is a three-door model. Recently, there has been growing speculation that the Golf R would only be available in Australia in a five-door format. These pics would tend to indicate otherwise. Don’t be surprised, though, if Volkswagen Australia limits supply of three-door models. This is just a hunch I have, and is not based on any firm information. More on the Golf R, including expected specification levels, can be read below. Yesterday, AUSmotive received an anonymous tip revealing initial specification details for the Golf R. Keep in mind these spec could change before the official Australian launch. Prospective owners of the hottest Golf sold in Australia should not expect the car to come standard with leather seats. Instead the Kyalami/San Remo black/grey fabric combination (shown above) will be the entry level spec, with Recaro-style micro-fibre and leather race buckets to be a $5000+ option. Regular leather seats can also be specced for $3300. It is a little difficult to tell from the images, but the wheels on the car at Fremantle may very well be optional 19″ Talladega alloys in black. Regular silver colouring will also be available in this sizing. Other optional specification will include Adaptive Chassis Control ($1500), premium Dynaudio($1300) and Bluetooth (assume regular Volkswagen accessory pricing). Bi-xenon headlights will be included as standard for Australian spec Golf R models. As will 18″ Talladega alloy wheels, front and rear parking sensors, metallic paint, LED rear lights and LED daytime-running lights. R-model specific trim and a three-spoke steering wheel will also be included. As expected, Australia’s designation as warm climate country dictates the Golf R engine will be detuned like the Audi S3, which uses the same 2.0 litre turbocharged four cylinder. That means power and torque numbers will be capped to 188kW/330Nm (down from European-spec numbers of 195kW/350Nm). The Golf R will be available in five colours; Rising Blue Pearl Effect, Candy White (as pictured above), Reflex Silver Metallic, United Grey Metallic and Deep Black Pearl Effect. No word on pricing yet, however, with no leather seats as standard it would seem reasonable to suggest that Volkswagen will target a mid-50K price range. This pricing was hinted at in February when Karl Gehling, Volkswagen Australia General Manager Press and PR, spoke with carsales.com.au. If mid-50s pricing does prove correct, that will see the Golf R undercut its Audi stabelmate by some $10,000. Volkswagen could be on to a massive sales hit here. Let’s wait and see! Uhmm…for $5k you do get 2 Recaros in leather. Yep, two seats, and the price is $5300 to be exact. 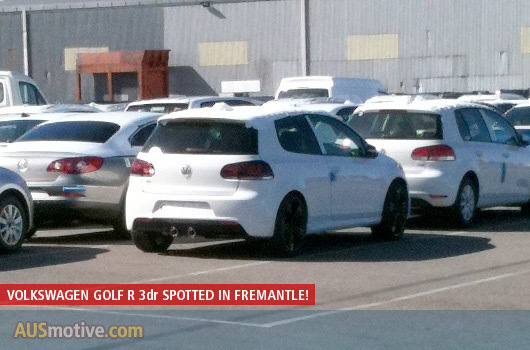 Also, apparently at least one Golf R (probably more) has been spotted at the Port Kembla wharf as well. The photo on the wharf doesn’t quite show the red hot glow of the brakes after the mongrel wharfies have thrashed it off the boat. Some wharfies might be ratbags, but I’ve witnessed cars coming off a boat at Port Kembla and they were pretty good actually. Im saying for 5K you could buy 2 leather recaros aftermarket, and put them in, and still have the orignal seats which you could sell or something. A bit of a rip that normal leather is 3k in a 50k car. Agree Dave, leather sports seats in a Porsche is a free option because of manual adjustments. Sports adaptive Porsche seats is approx 3K. I think VW are milking it on this one. From memory we paid (in theory) $2995 for leather seats on my wife’s GTI back in 2006. So, I’d say $3300 is about the same, with a bit of LCT thrown in for good measure. How much would this set be back? Hey Cat, the Recaros on the Golf R is more like the $7290 cf job offered by Porsche, but without the CF. Actually that price I just qouted is for a GT3, not sure how much that option is on a Cayman. Could be more! Re: Chico. All Volkswagen vehicles leave the fatory in ‘transit mode’ which limits the performance and therefore punishment that any lead footed wharfie can dish out. This can only be turned off at a dealership with VW diagnostics equipment. Also the performance seat option is rarely ticked due to the standard seats already being more than enough for most. VGA has confirmed only 5 Door vehicles for O., The car pictured could be for promotional use to guage public reaction. Thanks for that Tony, I had heard the ‘transit mode’ theory used before on Audi vehicles, as well. Presumably most manufacturers have a similar setting. the marketing team is doing their job well here. one with leather will be 55k+ on roads which makes sense?!?!?!umm?? you can get a discounted s3 for that price and there is no way in the world vw will be discuounting these things??? and yes you really can by an s3 on the road for close to the RRP (ex orc) just read the forums.If i were in the market i would strongly consider the audi badge for their cheaperst s range rather than the most exxxxx vee dub, as nice as it is >50 for a golf???? To be honest I’d rather have the 188 kW Scirocco R with fwd (and therefore lighter) and 3 doors 🙂 If VW won’t bring it here though I’ll might end up grabbing the 5 door R if that;s the only one available. At the end of the day an R is an R, right? 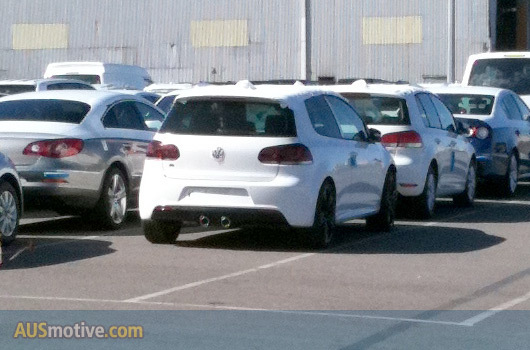 However, if the photos on the wharf are real, why would bother VW bringing over only a handful of 3 door Rs?! Meh, I rather a Polo GTI. Have too many fast cars already. damn what happen to the 188kw with 350nm as reported by motor mag and other sources???? Re the earlier comments about 5k seats, the racing recaros are the fixed back ones with the holes in the top for harneses and space behind for wearing a helmet no? You’d have to be a grand tonk to spec them in a car like this unless racing was its intended purpose, and you were fitting harnesses, not just taking it for the occasional dilly dally round your local race track. Stubz, it looks cool when I cruise down George/Chappel St bro! i’ve just got a call from vw mcgrath liverpool and they said that the R will have the full 199kw and 350nm like our new zealand counter part. I reckon that can be filed in the “I’ll believe it when I see it” folder. New Zealand wouldn’t be assigned “hot climate” status, so that’s why they would get the full power spec. I hope you’re right, though. So when do we get our first drive off between the S3, R and WRX? They all match in specs, but differ in prices greatly. Can’t wait. Why do people say that it will cost 55k?? VW said it will be priced between the current GTI and the R32.. I’m thinking that it will cost closer to 50k Espcially considering that the R wont have leather like the R32 and the production costs would be far cheaper to build then the R32. Given the S3 is priced at roughly $66K it would be astounding if VW could bring the R in at the low 50s mark. Then again, that could explain why discounts on driveaway pricing of over 10K are so readily available on S3s, haha. if the wharfies don’t flog them then the sales/service dealer guys do. don’t worry the cars get flogged regardless. Dave; You’re right, you do get a badge on the nose of an S3…and? Why does that make it better than a Golf. Have you actually driven a new GTi OR an S3? I find it incredibly hard to see how four chrome rings warrants a price difference of 5 to 10k difference in price when you compare between the models. cichlidsooty; You’re mate at McGay Volkswagen is a moron because the listed specs at the top of this page are straight from a VW email sent to dealers. As previously stated the Australian cars will be “hot climate” specs. But please gents, do any of you really think you can tell the difference from 11kW, 20nM which equates to a 0 to 100 difference of 0.2 seconds. Please! Jz; In my experience dealership staff are far kinder on cars than customer/race driver wannabes on a test drive who think its necessary to ‘test’ the car by hitting the redline in every gear, tyres squealing, smashing on brakes and scaring the salesman/his family half to death. Finally, everyone pricing up they’re own dream car please don’t forget that wonderful Government addition of LCT which applies to ANY extra in the way of another 33% before GST. Happy shopping. well it seems we are getting the 188kw and 330nm. hopefully it’ll be 50k driveaway since it’s a lower spec one now. Thanks a million this is incredible – I have been waiting for these specs for months now. The detail looks really official are they from a VW oz document? Did a dealer show you? Are you able to advise anything about colours? Thanks Liam I just wanted to place my order with a dealer who knows their stuff. Golf R 3 Door has just been confirmed for Australia. Sales will be strictly limited and cars will be extremely scarce due to the first batch going only to dealers with signed orders. So if you want one get in and lay down your cash now. r u serious??? how much is it as well??? Sooty, go to VW’s facebook page. It has been confirm by VW themselves. by the way : i think golf r lost ( park assist) whyy?and why? !!!!!!!!! Funnily enough, a VW Golf R costs more in the UK than an S3.